Powerful plant-based, non-phototoxic serum with a potent blend of Vitamin E rich botanicals to preserve skin's youthful appearance. 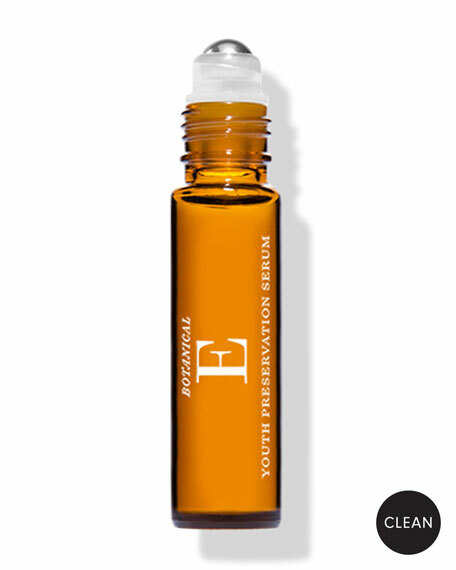 Botanical E Youth Preservation Serum proves that not all serums are created equal. Featuring powerhouse ingredient, Vitamin E, a potent antioxidant with nourishing and rejuvenating properties to nourish and deliver an anti-wrinkle effect for a youthful, healthy looking glow. This non-phototoxic serum will not cause sun damage when exposed to sunlight, so you can wear in the AM/PM without fear, a true breakthrough for facial serums. Offering a stable shelf-life of 1 year, this serum's antioxidant properties work effectively and efficiently, without cause more harm to the skin or added redness or irritation. Green Tea Seed Oil  cold pressed from the seeds of the plant to act as a powerful antioxidant to support the appearance of skin elasticity. Watermelon Seed Oil  creates a super moisturizing, yet lightweight effect. Composed of fatty acids that help soothe and maintain healthy looking, nourished skin. Meadowfoam Seed Oil  U.S. grown oil with a rich source of Vitamin E. This oil is highly regarded for its oxidative stability and unique lipid composition; keeps the formula fresher, longer. Sea Kale  rich marine source of vitamin E with powerful carotenoids, sea kelp helps soothe and improves the appearance of the physical signs of photo aging. Antioxidant Astaxanthin  powerful, naturally occurring carotenoid pigment found in marine plants known for its super vitamin E content and ability to improve the look of UV-induced premature wrinkling/aging. Barbary Fig Plant Cell Actives  high in Vitamin E content, works to soothe, soften and refine the look of the skin. Fragrance-free, cruelty-free, vegan, and dermatologically tested. 93% of the total ingredients are from organic farming certified by ECOCERT®.